There may come a time when an inquisitive kitty who has spent her whole life indoors will dart outside to see what she’s been missing out there and become lost. The first thing to remember is that most kitties will actually stay fairly close to home. While you may not be able to see or hear her, she may be in the hedge just beside your house. She may be so overwhelmed with all the new sights, sounds, and scents that she just “freezes” in place. Or another possibility is that she may actually have chased another small animal, a lizard or even a bug into a dark undercover place and is so focused on actually catching her first prey that she tunes you out when you call her. Not to worry, there are several methods available to you to recover her and bring her home safely. If you have developed a consistent routine of sleeping, eating and playing, around the next meal time she will begin to feel familiar hunger pangs, and remember that it is time to fill her tummy! This would be a good opportunity to fill her bowl and bring it outside near the door from which she made her escape. You may choose to sit out there for a time and softly call her name if you have the time and the weather is permitting. I know that no matter where my little kitten Misha is hiding in our house when I fill her bowl with her evening meal and tap the side with my fingernails she comes running! There are multiple options for tagging a pet to enable you to find them easier in just his situation. Nearly every veterinarian, shelter, or animal control agency offers to microchip your pets. The chip is about the size of a small grain of rice and is injected just under the skin between the animal’s shoulder blades. They also have the readers for obtaining the owner information from the chip of a stray animal, which will include your name, address and phone number. This information can be updated online if you move or change your phone number. 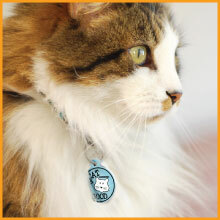 A new technology of “smart tag” is now available, provided by PetHub.com. This is a QR (quick response code) which is the square matrix of code that can be read 2 dimensionally (horizontally and vertically) as opposed to the barcode which can only be read in 1 dimension. There are multiple advantages to the QR tag, first and foremost is that they will hold more information. In addition to your contact info, you can include the pet’s name, age, breed, allergies or medications that they may need, and much more. You can create this profile online at their website, and there is both a Basic (free) level and a Premium level subscription. Another advantage is that the QR info can be scanned with a smartphone, so any good Samaritan can retrieve the profile information and contact you immediately. If they are unable to reach you, there is also a PetHub call center (manned by real people!) who can send you an email notification that your pet’s tag was scanned, and a GPS map of the location where they were when they were scanned. This is a wonderful service, and I feel every pet owner would want to take advantage of this service and the caring community of pet lovers who are also members. It’s been 24 hours, what do I do now? So now you’re approaching panic mode…completely understandable. There are still several steps that can be taken. Many shelters will loan (on a temporary basis) a Havahart trap. This is the type of trap used by the ASPCA and many local animal rescue groups in SNR (spay, neuter, release) programs to help reduce feral cat populations. If it has now been a day or two, or longer, since you have seen your precious pet this is a good option. The process goes something like this…place her favorite food in the trap along with an article that has her scent, your scent, or a combination of both. Oftentimes it may take 2 or 3 days (or as long as 10 days for one of my neighbors) for a kitty to overcome her frightening outdoor experience and calm down enough to come home. The combination of her favorite food and the scent of the safety of her home will be exactly the right key! When all is said and done having one of our furry babies get out of the safety of home and be missing for any length of time is a frightening experience. But with a good schedule, a strong bond, and the help of modern technology we needn’t worry today as much as we once would have. If you have any additional suggestion or comments please feel free to share them here. This happened to me recently. Thankfully max is back safe. But Im looking to get him micro chipped to avoid all that worry next time. Thanks for all the tips. I will definitely try some of those next time. Thanks for stopping by. And thanks for sharing your experience with your cat Max. I’m so glad to hear he made it back home safely. Check around your local shelters, pet stores, etc. they will sometimes have microchipping events and offer the service at a reduced price. All the best to you and Max! I have two cats and they have been inside their whole lives with a couple exceptions. I used a have a roommate who wasn’t very observant and would let one of them out all the time. Luckily he would only go as far as the back door to the house and cry for me to let him back in. The other one was too scared to even try to escape. Thanks for taking time to read my post. I’m glad your bond with your cats was strong enough that they never were tempted to wander far away. That is a great testament to you as a pet parent! Feel free to come back with any comments or questions in the future. Thanks for sharing your experience with your Aunt’s cat. Since cats are quite smart they can become so focused on their task that they tune us out, and suddenly they find themselves in unfamiliar territory. I’m pleased to hear you convinced her to microchip. It will give her peace of mind should kitty disappear again! This is very helpful and I’m glad you went into detail about tagging your pet. I had two outdoor cats growing up and usually the older cat would hide inside the garage in the cabinet. When we felt like we lost her, all we had to do is search and she would be there but one day she just disappeared leaving her son behind. We looked for her but she was no where to be found. I wish I had a tag to find her but didn’t. Thanks for stopping by my site. So sorry to hear about your experience with losing a beloved pet. Today with all the technology available even just using social media is helpful in finding a lost pet. Still I feel chipping or tagging is the safest way to insure a furry friend is always returned to her loving home when she decides to go out for an adventure. Thanks for your input, and I wish you all the best with your future pets. Thanks for stopping by, and for offering your input. I do hope your daughter has her cats spayed/neutered to prevent the increase in unwanted and abused animals put to death every year. Best wishes to you and your furry friends. Next Next post: What’s up with kitty litter?